Walk to the Beach, Island View Casino, Downtown & Harbor! Pets Stay for Free! 2 Bedroom, 1 Bathroom bungalow near the beach and casinos. This cozy bungalow has two bedrooms with queen beds as well as a small futon. A large front porch, and small back porch for relaxing and catching the breeze. There is a couch in the living room with two large comfortable chairs. There is also a t.v. in the living room that has basic cable and can access Netflix via the Roku that is provided as well. The dinning room seats 6 comfortably, but there is a bench seat and a few extra chairs if you need to squeeze in a few more. There is a fenced in back yard with a nice porch, that has a small gas grill, a bistro table that seats two for dinner al fresco! As well as a dog house for your furry friends. The kitchen has most of what you would need to whip up a vacation meal. It is equipped with an electric oven/stove, microwave, wine cooler, fridge, blender, and all the utensils you will need. There is one bathroom in the home that has a large double shower, and a vintage claw-foot tub for those nights you need to kick back and read a book. Lastly there is a washer and dryer that tenants are more than welcome to use. I am a local business owner with a love for the outdoors, and social gatherings. I love nothing more than cold drink on a front porch! I purchased this lovely home from my grandmother. When she told me she was going to sell it, I knew I had to have this charming bungalow. It has always been a very happy home, and I am happy to share that with visitors from all around. This house is conveniently centrally located. It is walking distance from casinos, the beach and a fun splash pad play ground for the kids. There is also a homemade candy store within walking distance for the kids to visit. The downtown restaurants that offer local seafood, steaks, pizza, and Cajun cuisine are a two minute drive. Come stay at Casa Verde, hit the town for some amazing food, then take a stroll down to the beach to catch the sunset! We accept payments in PayPal, cash or check; Call and book your relaxing vacation today! This bathroom is state of the art without losing the integrity of this wonderful vintage bungalow. There is a double headed shower, a claw-foot tub. The bathroom is environmentally conscious with its low flow water (with out the low pressure). There is also a blender, and a wine cooler for your evenings on the front porch. Dining Area has extra seating for those unexpected guests! The home is near a cool free splash pad within walking distance. There is not a pool but its a fun place to splash and play on a hot day. There is a large television in the living room that has basic cable and access to Roku, a device that allows internet access to Netflix. There are tons of movies and T.V. shows at your finger tips. This cottage worked out great for us! While the first night was a challenge for us and our dog due to the train noise and a thunder storm, the train noise the remaining noise did not bother us. The cottage was clean and very confortable and we would definitely stay again if we returned to Gulfport. Thank you again for choosing Casa Verde, James! Sorry the weather didn’t cooperate on your first day. Hope you’ll come back again in the future! You were a pleasure to host. Cute place! And convenient to everywhere we needed to be! Would go back in a heartbeat! Nice house could use a little work but nice location close to alot. Little close to railroad track but nothing new. Live pretty close to railroad track back home. Great placed if you have dogs. Every thing was there. I guess that's all you can ask for. Our second time was just as perfect as the first! Liz is very welcoming and communication was spot on. Her house is so comfortable and close to everywe wanted! Thank you again! Needs a little tlc. Backyard is in desperate need of upkeep. Outside is in shambles. AC not working upto par. Summer heat to strong for outdated ac unit. Wonderful, cozy and quaint little house! Pet friendly was the extra plus to our great stay. Liz was so helpful and responded to emails very promptly. Good location, close walks to casino, beach and very nice park that dogs insisted we go to all 6 days we were there. And for the review that complained about the train track, it’s not that bad at all. We actually looked forward to it coming by. Would definitely go back! Thanks again Liz! I am so happy that you enjoyed your stay! I hope you will come back again on your next visit to the area! It's so nice to rent the home I love to such lovely people and their pets! Looking forward to your next visit! 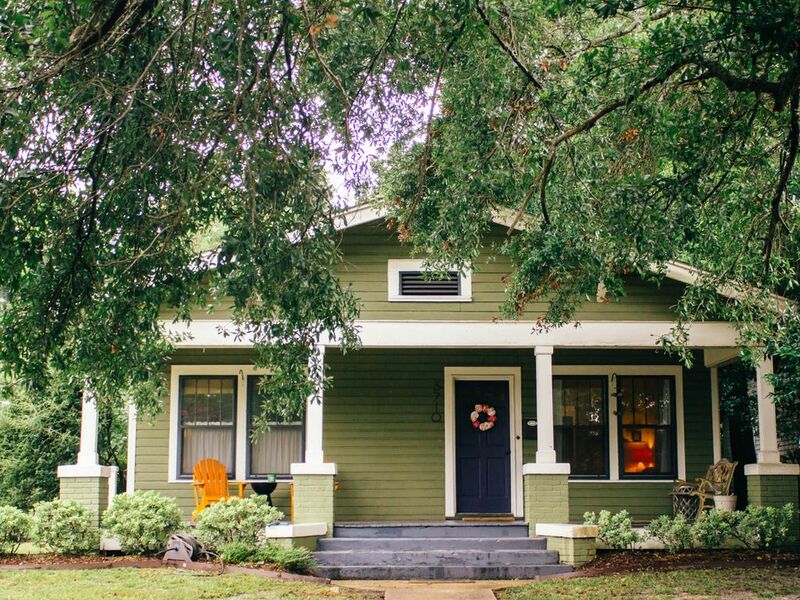 This darling southern bungalow, rests between a Live Oak and a Mississippi Magnolia. It is located within 4 blocks of Gulfport’s beautiful white sandy beaches, and a mere 250 feet from the Island View Casino. Not to mention the other 12 casinos within a 30 minute drive! Downtown is 1.5 miles from this rental, and offers lots of unique dining options. If its shopping you are after Gulfport’s Prime Outlets are 5.7 miles away. Although this is the perfect location for adults to relax, and play, it also has some pretty fun things for the kids. There is a splash pad water playground, free of charge, about 4 blocks from the house, the Gulf Islands Water Park is 7 miles away, and the Lynn Meadows Discovery Center, Children’s Museum (voted top 10 children’s museum in the country) is less than 5 miles from your vacation home. For family fun head to the Ship Island Excursion boat for a day of fun on the beautiful beaches of our most popular barrier island! Casa Verde is proud to boast a 5 star rating on VRBO due to the combination of amenities, location, and service provided. We except payments with PayPal, cash or check. Call to book your relaxing vacation today!